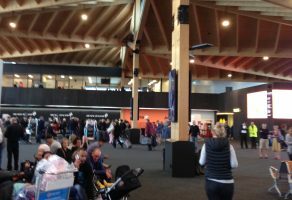 After a dawn ceremony on October 5 the first stage of the new Nelson Airport terminal building opened. From the outset the design team had worked creating an iconic gateway to the region, with an emphasis on local materials, most notably NelsonPine LVL. Stage 2, which will house departures, inbound baggage and the Air NZ Regional Lounge, is in manufacture and the full terminal will be open for business late 2019. 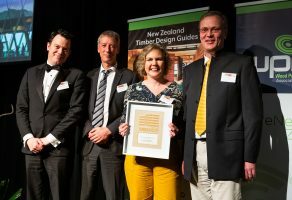 The NZ Wood-Resene Timber Design Awards were held on September 20 in Auckland. NPIL sponsors these awards and in particular the category ‘Excellence in Engineered Wood Products’. NelsonPine LVL was used in five of the finalists projects, with an admirable end result of three winners and highly commended out of ten categories. These were the Mount Pleasant Community Centre (Christchurch), The Otago Polytechnic Student Village (Dunedin), Kaikoura District Council building, Seafood Research Centre – Plant & Food Research (Nelson) & Ara Kahukura (Christchurch). Kai Kruse (right) had the honour of presenting the Nelson Pine sponsored award, Excellence in Engineered Wood Products, to the Seafood Research Centre – Plant & Food Research (Nelson), designed by Nelson architect Simon Hall of JTB Architects. NPIL is furthering its already impressive track record in energy savings, with the employment of an Efficiency Engineer part funded by the Energy Efficiency and Conservation Authority. Reece Clements has an overall goal of saving NPIL two gigawatt hours of energy in his two years with the company. 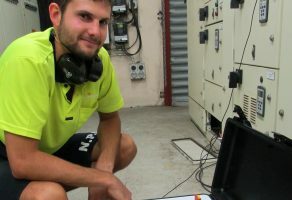 To make this job more accurate NPIL invested in two hi-tech data-loggers that are now gathering robust data on how much power is used by any selected machinery. The data-logger reveals where worthwhile efficiencies can be made on plant, often to be replicated elsewhere in the factory. NPIL was collecting energy use data before, but with the data-loggers the company can now verify savings more easily and set targets for further savings in energy use. 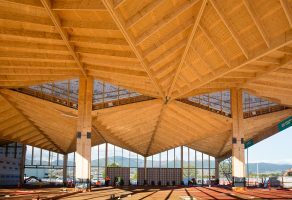 The new terminal at Nelson Airport will be a gateway to the city that tells a story of one of the Nelson region’s biggest primary sectors, the timber industry, and the NPIL role in processing plantation Pinus radiata. There are two aspects to the radical design. The first is the particular way the building is being constructed to be earthquake proof. The beams are all attached using special RSFJ Moment Resisting Frame connectors developed and part-funded by the University of Auckland. It’s an innovative New Zealand technology that is solid in normal circumstances but flexes in the ‘moment’ of an earthquake and allows the building to move – thereby resisting any damage. The second radical design aspect is the look of the building, with the glass walls front and back allowing passengers to look through to the Nelson hills. The repeating peaks of the roofline are designed to complement the view of our local landscape. To make that shape possible the engineers have designed a series of composite triangles. All these components are being precision machined utilising hot-pressed and cold-pressed NelsonPine LVL. The first stage of the new airport will open to the public in September. NPIL expects to start manufacture for the second stage in late July; and to start LVL deliveries again in November with building on site beginning in January 2019. Nelson turned on the spring sunshine to show a group of SFC executives the hi-tech harvesting techniques used in the Moutere forest owned by Tasman Pine Forests. They attended a field day organised by the Forest Growers Research (FGR), in the company of Louise Upston, the Associate Minister for Primary Industries. 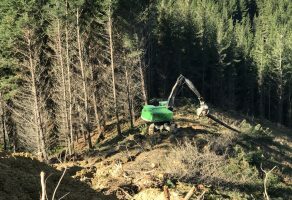 The innovative and safety enhancing products and equipment demonstrated have been developed by equipment manufacturers and logging contractors in conjunction with Forest Growers Research.